In the fra mework of ITE HCMC 2013, on 11th Sept., the 2nd Lower Mekong Tourism Cities Mayor Summit-2013 was held in Ho Chi Minh City. The event had the attendance of cities’ leaders including Phnom Penh (Cambodia), Vientiane (Laos), Yangon (Myanmar), Bangkok (Thailand) and Ho Chi Minh City (Vietnam). The summit focused on key issues such as: reviewing tourism cooperation on the Joint Declaration of the 1st Lower Mekong Tourism Cities Mayor Summit-2012; agreeing solutions to develop tourist products; cooperating for tourism promotion within cities in the region. At the summit, the cities’ leaders have discussed to enhance tourism cooperation focusing on 4 fields: connecting tourist products; training and developing human resources; linking tourist promotion activities and cultural exchange; strengthening cooperation in the region step by step. In addition, Bangkok and Ho Chi Minh City also committed to sponsor six scholarships per year for tourism students from Phnom Penh, Vientiane, and Yangon studying here. 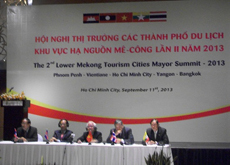 The 2nd Lower Mekong Tourism Cities Mayor Summit-2013 is a chance to promote tourism as well as uphold cooperative relationships between cities in the region. Closing the summit, a Joint Declaration of Lower Mekong tourism cities was released aiming to develop the region of Lower Mekong into an attractive destination of the world. It was agreed that the 3rd Lower Mekong Tourism Cities Mayor Summit-2014 will take place in Bangkok (Thailand).